Today was such a long day. It has been hot here in cold, rainy Washington… hot and muggy. Ok, warm and muggy, but we’re wimpy and all this mugginess just makes us grumpy. So, of course all I want to do all day is run my a/c with all the doors and windows shut, which is glorious and refreshing and consequently makes me want to bake. Not sure what the correlation is, but hey… I’ll go with it! Yesterday it was classic, perfectly chewy Chocolate Chip Cookies. We did our weekly Costco run today and I just about squealed when I saw bags of fresh cauliflower florets in the produce section. I am SO excited to start playing with all these fun recipes! 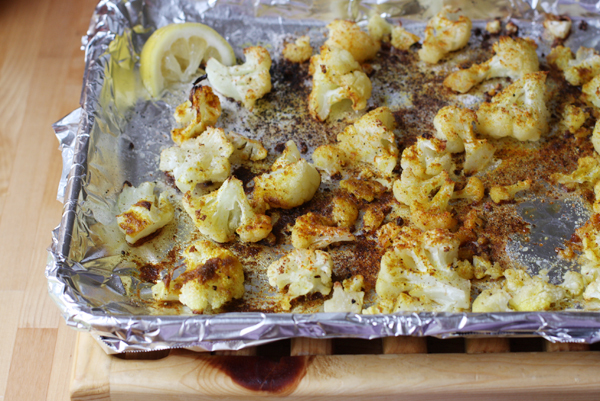 But first, my favorite… roasted cauliflower. With a healthy dose of curry powder, cayenne and fresh lemon. Oh, man is that a delicious treat! You get the point, right? The recipe is so simple, it’s more of a method really. Take some cauliflower florets (as much as you want to eat), toss them with some good melted coconut oil or olive oil. Spread them all out on a baking sheet (in a single layer please!) and season generously to your liking. I just start sprinkling stuff on until it looks… seasoned, you know? If you’re nervous, start light and you can always add more salt, spice, etc. at the end after you taste it! Preheat the oven to 500ºF. Line a baking sheet with foil for easy cleanup. Toss the cauliflower florets with some good melted coconut oil or olive oil. Spread them all out on the foil-lined baking sheet in a single layer, and season generously to taste. 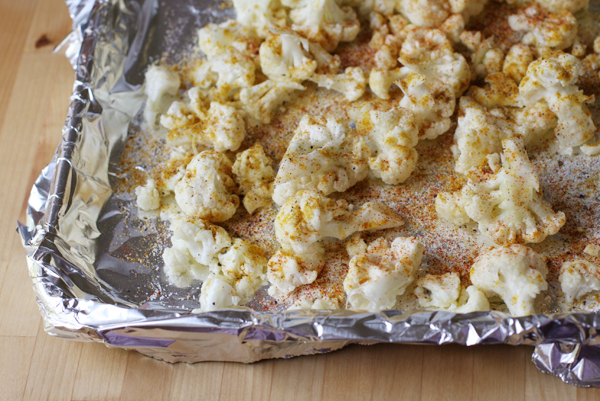 Place the pan in the oven and roast for about 15-20 minutes, until the cauliflower is nice and golden. Remove, sprinkle generously with lemon, taste for spices and enjoy!